Ephesus - Enter through the Magnesia Gate and begin a slow, downhill walk with your guide into the ruins of this Roman provincial capital. Your route takes you past the Odeum, the Celsus Library, the Temple of Hadrian, the Fountain of Trajan and the Great Theater. Basilica of St John - Built by the Emperor Justinian over the tomb of St. John the Apostle, the Basilica, now in ruins, once rivaled St. Sophia in size. One can still see graceful columns, mosaics and frescoes. Ephesus Museum - This small museum in Selcuk boasts an incredible collection of Hellenistic and Roman statues, carved reliefs and artifacts unearthed from the ruins of Ephesus. The famous statue of Artemis (goddess of fertility) is housed there. The Terrace Houses - Also called as "the houses of rich", Terrace Houses located in a newly excavated area across from Hadrian's Temple, this section of Ephesus is a very special area inside the site. The wealthy and important people of Ephesus used these houses which are finely decorated with mosaics and frescoes giving a true impression of the ancient lifestyle. These houses are the finest examples of Roman domestic life in the world. Terrace Houses. 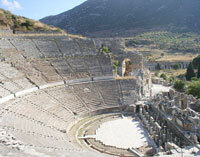 Following the lunch break, depart for The Basilica of St. John and The Ephesus Museum. By the end of touring, return to Kusadasi. - Walking at the House of Virgin Mary includes approximately 0.50 mile over mostly paved walkways with some inclines to/from the car parking area to the shrine. The car parking area is constructed of uneven gravel/dirt surfaces. - Visiting Ephesus includes walking approximately 1.5 miles over uneven and cobblestone surfaces, inclines and 100+ steps (mostly at the Terrace Houses). Comfortable walking shoes, comfortable clothing, a hat, sunscreen and insect repellent are recommended. Guests should watch their step at all times in order to avoid injuries. - Guests must be able to walk approximately 0.5 miles over uneven and cobblestone surfaces, inclines and 10 - 30 steps in The Basilica of St. John. - Approximate time to reach to The House of Virgin Mary is 35 minutes.